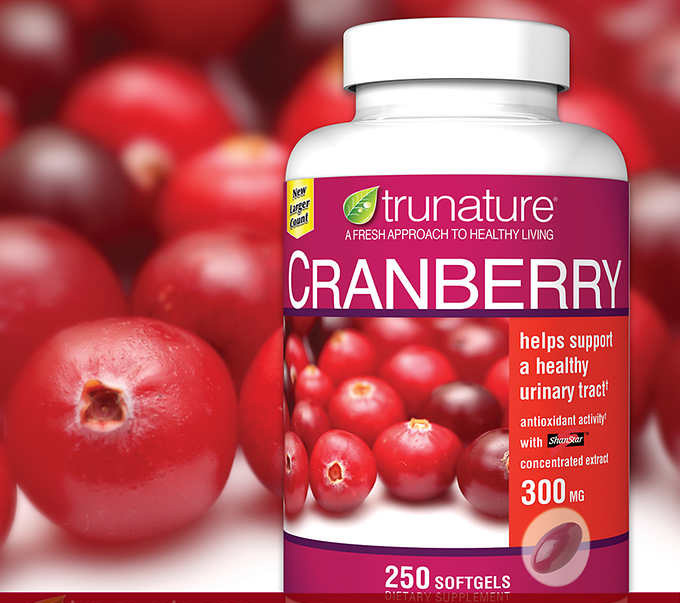 Trunature® Cranberry 300 mg - 250 Softgels SALE! Suggested Use: Take one softgel three times daily with water at meal times. We recommend drinking a full 8-ounce glass of water when taking cranberry softgels and drinking 6-8 glasses of water or other liquids each day. Ingredients: Cranberry Fruit Extract, Gelatin, Yellow Beeswax, Soybean Oil, Rice Bran Oil, Soy Lecithin, Glycerin, Water, Titanium Dioxide (Artificial Color), Red 40 Lake, Blue 2 Lake. WARNING: If you are pregnant or nursing, consult your doctor before taking this product. There are no known side effects from taking cranberry supplements, although individuals with history of kidney stones should consult their healthcare providers before taking cranberry supplements.3 Some individuals consuming large amounts of cranberry cocktail or juice (>1 liter) have experienced gastrointestinal upset including nausea, vomiting and diarrhea, but such side effects have not occurred in cranberry supplement users. 2 Stothers L. A randomized trial to evaluate effectiveness and cost effectiveness of naturopathic cranberry products as prophylaxis against urinary tract infection in women. Canadian J Urol 2002;9:1558-62. 3 Avorn J, Monane M, Gurwitz JH, Glynn RJ, Choodnovskiy I, Lipsitz LA. Reduction of bacteriuria and pyuria after ingestion of cranberry juice. JAMA 1994;271:751-4. 4 Stapleton AE, Dziura J, Hooton TM, Cox ME, Yarova-Yarovaya Y, Chen S, Gupta K. Recurrent urinary tract infection and urinary Escherichia coli in women ingesting cranberry juice daily: a randomized controlled trial. Mayo Clin Proc 2012;87:143-50.